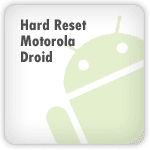 To perform a hard reset on your Motorola Droid, perform the following steps. Turn off the Droid. If you are unable to turn off the Droid, remove the battery for 10 seconds, then replace it. Open the physical keyboard and press the X key while pressing and holding the Power Button. The device will turn on, keep holding these two buttons until a yellow triangle appears. Press the Volume Up and then the Camera button at the same time to get a menu to come up. You may have to press them more then once. You have now entered Recovery Mode. Use the Directional Pad on the Physical Keyboard to select the Format option. This should perform a factory reset of your device. You will of course lose all data. Please exercise caution before doing this without a backup. Note: Contacts, etc. should be backed up to the cloud, so you should be safe with your address book.